All the action of live matches right on your PC! Pro Wrestling Superstar is a unique simulation of professional wrestling where you're the promoter! Run singles, four-man tag, six-man tag, Triple Threat, and Fatal Four-Way matches. Enable or disable countouts, adjust the time limit, and configure matches to your liking. Choose from a variety of match types such as Steel Cage, Texas Death, Russian Chain, Battle Royal, and many more! Create and customize wrestlers with the Wrester Builder. Export wrestlers to PDF or HTML files. Sixty wrestlers are included to help jumpstart a promotion. Direct access to an online wrestler repository with thousands of wrestlers available! You choose the wrestlers you want and PWS will download and install them for you! Track wins and losses for wrestlers and tag-teams with the Results Database. Export match history for wrestlers and tag-teams to HTML files. Add, edit, and delete results in the Results Editor. Easily manage a promotion/federation. Create a roster and the championships for the promotion. PWS also tracks title histories for each promotion. Create and customize managers/valets using the Manager Editor. Managers can provide that extra "assistance" that can completely change the momentum of a match! Run singles and tag-team tournaments with any number of competitors using the Tournament Manager. Export tournament results to an HTML file. Prefer to roll your matches on the tabletop? PWS has you covered. Create, Export and Print wrestlers in the wrestler editor. Manage your promotions in the Promotion Manager. Add and edit match results with the Results Database Editor. With the Card Editor you can create and run your own wrestling shows. The results of each match are saved with the card. Cards can also be exported to HTML for posting on websites. PWS has the best user support of any wrestling sim out there. The support for PWS is consistently praised for having rapid response time and going the extra mile to make sure issues are resolved efficiently and correctly. Check out the latest release notes and see what features were added to PWS in the last release. Pro Wrestling Superstar has an awesome community of players and promoters! Whether you need help getting started or you're looking for wrestlers and matches to download, the Pro Wrestling Superstar community is there to help. Download wrestlers and matches, swap ideas with promoters, and ask questions. Promoters are also encouraged to post match results from their events. An invaluable resource to the Pro Wrestling Superstar community. Random thoughts from the developer behind PWS. An awesome fantasy wrestling federation using PWS. About 10 years ago, my mom was clearing stuff out of her house and sent me a box of stuff that included the Superstar Pro Wrestling game. Of course, I had to break it out and play a couple matches,. I tried to start up a fed again, but after a while, running cards by yourself with no one to share gets old. Then, when I was searching on the Internet one day, I stumbled across PWS and found not only a wonderfully efficient way to play the Superstar Pro Wrestling game, but also found others like me who share a true passion for the game. Having the computer run the match is a big time saver, but sometimes I like playing it manually because it takes me back to my cards and dice days. Although I am not active in the community as I once was due to other life commitments (work, family, dissertation, etc. ), I still love this game and look forward to the opportunity when I can get back at it again. Buy Pro Wrestling Superstar for Windows Now! Buy Pro Wrestling Superstar for Mac Now! An unsupported version of PWS is available. It has fewer features than the paid version, but it's a great way to get a feel for how PWS plays. 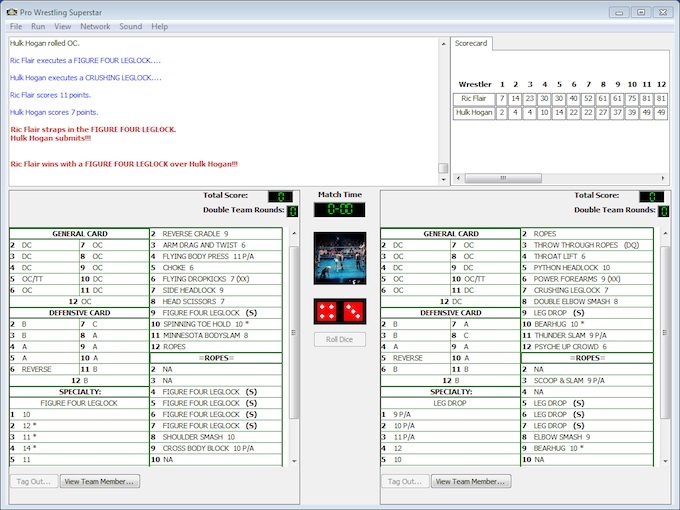 This unsupported version has a wrestler editor, match result tracking, and a tournament mode. It does not have managers, the Promotion Manager, or the Battle Royal mode.